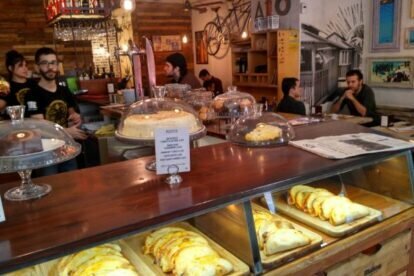 I was thrilled to discover Aió when I came home to Madrid after a holiday in Sardinia – authentic Sarda food with a menu del día (fixed price lunch menu) for just 9.50 euros. There is always a pasta option, and they are very generous with the parmesan! Apart from the menu, their speciality is the pizzetta – small folded pizzas, with various filling; it’s the perfect snack. The homemade desserts are really good too. I also love the drinks menu, which has a well-priced wine list featuring Italian wines, with quite a few from Sardinia, as well as aperitifs such as Aperol spritz. This restaurant is one of the first to have the now ubiquitous recycled and upcycled decor, and after the 6 or 7 years it’s been open, it’s still looking good. I especially love the artwork in the front part of the restaurant. I’ve taken many people here over the years; try it and see if you like it as much as we do!